You do not have to go to Harvard to be successful! In fact, most successful people did not! You do not have to even go to college! There are many small and larger business owners who never achieved college degree. Some of the most famous are Bill Gates (Microsoft), Steve Jobs (Apple), Michael Dell (Dell), Larry Ellison (Oracle), Ted Turner (CNN), Ralph Lauren (Polo), and Mark Zuckerberg (Facebook). Richard Branson (Virgin) , David Karp (Tumblr) , and Kirk Kerkorian (MGM hotel & casino). Americans stress education, training and experience and I just countered that argument with examples of people who succeeded without education, training or experience’ They are really the exceptions not the rule, but it was their determination against all odds that they succeeded. They were rewarded f handsomely for their determination and you can too. They did not give up the first time they failed! They probably failed often, but kept going until they succeeded. Many of my examples are people who were in high technology but not all of them. Ralph Lauren sold neckties to his classmates in high school. As an adult, he designed a European style necktie and made his first sale to Neiman Marcus. From neckties to a menswear line and the rest is history! It has grown to a multi-billion dollar company. Clothing or fashion is probably one of the toughest and roughest business out there. Sheer determination helped him achieve a fashion empire. What does determination look like? I am not talking about physical toughness, although in some instances you may need it. Determination is more mental toughness which is much harder to see, but just as evident. I remember seeing some marathoners finishing a race that the elite runners complete in two hours and twenty minutes finish in eight or ten hours. That is just one example of determination. For that marathon runner, the race was far more difficult to complete and required a lot of determination rather than skills. When companies recruit at colleges, they want to see good grades, student activities, sports, etc. to indicate success. The higher the grades, the more likely an offer! There is a strong reliance on grades, majors and quality of the program. In other words, the better the school, the more likely the offer. Determination has something to do with it, but it is still academics. If a student can achieve good grades and get into a good school and compete in that environment, it is all a company can measure, but is it? Determination shows up in kids, but we do not look at it as positive. They are willful, stubborn or headstrong. When they achieve or accomplish something based on that perseverance, they are considered determined. It is seen in athletes, good students and entrepreneurs. All those jobs you performed as a child such as lemonade stand, delivering newspapers or mowing lawns demonstrates determination or perseverance.Employers are still looking for demonstrated indicators of discipline and determination. Determination looks like someone who gets things done no matter what. The college applicant participates in a lot of activities besides academics and does well in all of them. I am not referring to high grades as much as doing a lot of things well. Many people may have high grades if that is all that concentrate on, but they may not demonstrate their skills in other ways. In work, it helps if you enjoy what you are doing. It is much easier to be determined when you like what you are doing. In my career and personal life, I was always the one who people sought out to get things done. I saw it as a game! Getting people to do what you want is what leadership is supposed to do. I just saw it as a goal or outcome from anything I was doing. It might be a low price, a job or some other goal. I still have not achieved every goal within my time frame, but I keep trying. 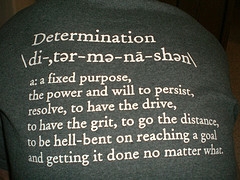 Determination means several things to people, but bottom line it is getting things done. It is not giving up no matter how difficult the goal may be. Some say it is the motivation or what keeps you going when you would normally give up. Whatever the reason, it works! I know because it worked for me all my life. For me, it gives me confidence because I know I will succeed every time. I keep working when other s are unwilling to. Determination beats everything! Determination is an integral part of someone’s success. Determination keeps you going despite you lacking of resources, education, and experience. Determination beats everything and that’s true and we’ve seen it in the lives on some of the most famous and successful people in the world. It gets you through the difficult times!